Is it possible to show a fluid (water) over-flowing from a large tank into a smaller tank? I would like to show a fluid such as water flowing through a testing fixture. There is an inlet at the bottom of a tank and the level must rise to a certain height and flow over a weir before it can travel down a pipe to the testing fixture. Is there a way to just show a fluid flowing over this weir in motion analysis or flow simulation or something else? Re: Is it possible to show a fluid (water) over-flowing from a large tank into a smaller tank? Not sure with motion analysis OR simulation but with motion study/animation this should be doable. I think Deepak Gupta is correct. I just comes down to the question: how much imagination do you need? Is a graph fine, or do you need more. While I haven't use motion study yet, I am assuming motion study has something to do with graphs, including all the possibilities of what assuming anything makes you. I'm not 100% sure, but I highly doubt this can be done with motion analysis; motion analysis is for rigid body dynamics. Are you wanting to do this for a visual presentation, or are your trying to calculate specific quantities (velocity of the fluid for example)? I was thinking in terms of a plot of moments of inertia, which one should be able to plot in motion analysis. But of course it is a given that I could be wrong in assuming, as they are in ft^4 power. What does that even look like? My point was that the motion analysis tool in SW is for Rigid Body Dynamics, so we're solving for the motion (position, velocity, and acceleration) and reaction loads on rigid bodies (i.e. constant internal moment of inertia) under loads (forces, moments, gravity, etc.). Rigid Body Dynamics is not based on the Finite Element Method or Finite Volume Method; it's based on Lagrangian mechanics, and I can't see how one could get any meaningful information about fluid flow using Lagrangian mechanics. This might be something that can be done with a flow simulation, but my background is not CFD so I can't say either way. 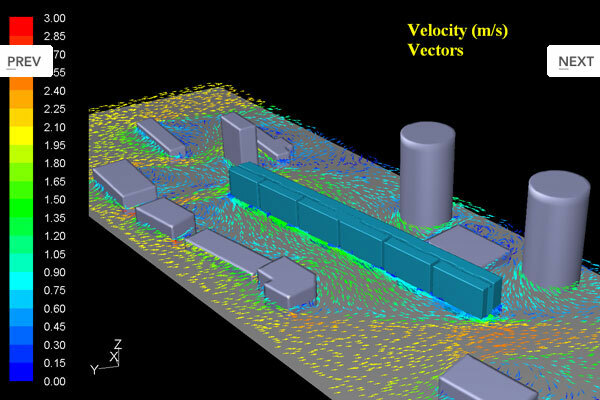 What I can say is that if the need for a visual of fluid flowing is purely presentational, then doing a CFD analysis seems like over-kill (although the OP might not have access to a animation-based program that can mimic fluid flow). I also think that if one were to solve this with CFD, all they'd have access to are vector or streamline plots (and not a rendered 3D animation). 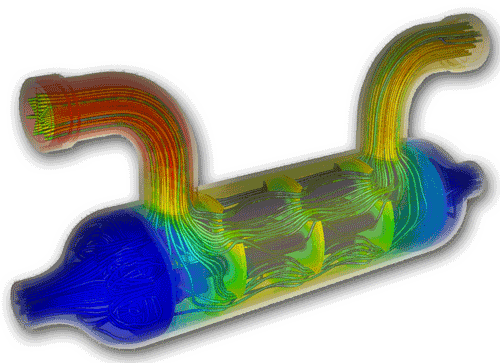 In Flow Simulation, you can define a fluid volume and once you simulate it should show region. I do not believe motion analysis will do what I am looking for either. All I am looking for is a visualization of fluid flowing through the part as it is intended to operate, purely for presentation reasons. I don't have much experience with CFD, but I am not looking for anything near that detailed. I would assume it should be able to give me what I am looking for. I just don't know how yet and if it is actually worth the trouble. I can upload a screenshot of the part tomorrow if that may help. From a visual standpoint, all you'll get from a CFD analysis (I believe) is either a streamline plot or a vector plot (examples blow). If this isn't what you want, then you'll probably want to look at 3D animation programs. The vector plot will actually work, or even a particle study I suppose, but I have never been able to get a particle study to work right. Then again, I don't really know what I'm doing with CFD. I actually wont get a chance to work on this again until Wednesday instead of tomorrow. I guess I'll try to just run a rough CFD analysis and see if I can get something close to start with. A particle study might work, however... you would need to define the space above as part of the fluid also. Because Flow can't handle the change from liquid to gas you need to fool it. Have the whole cavity filled with a low density gas. Then from where your water comes from, inject a much denser gas. Then if you fill it SLOW enough they will stay striated and the denser gas will flow over the weir. At that point you could use particles or potentially even flow trajectories with colors dependent on mass fractions. Granted, that is all predicated on the difference in density being enough to keep them separated. I don't recall how much difference in density Flow allows for gases. Sorry it has been a while since I logged in. The trick of using gasses with large density differences actually gave me something like what I was looking for! Thanks for the great idea! David, would you mind sharing your end result and process used for it. Glad to hear it helped. Any chance you can post a video or screenshot of the result for future reference? Any details you add here might help someone else in the future be able to search and find this post to use this approach for their projects. Sorry, I'm pretty new to forums... That's a great idea to upload the results for future reference! I will get some details uploaded when I get back to the office this week. Flow does not handle free surfaces. A free surface is what you are describing. A cup of water. A toilet bowl. Fluid sloshing around in a tanker. In Flow, you define a closed volume and inside that volume, you define a fluid. A system with a free surface has two fluids. One below the free surface and one above. Flow is not capable of even defining that. I apologize to anyone who comes across this thread, but I actually can't post a screenshot of the model because it is part of a research project. What I ended up doing was just show a few particles following the water that would be inside if the volume was sealed. I used an internal analysis using water as fluid, inlet volume flow, outlet environment pressure, global static presure goal, global velocity goal, surface mass flow rate goal on inlet and outlet, equation goal for inlet minus outlet, transient 30sec analysis, include gravity effects, all other conditions default. Hope this helps explain the setup. The results were just particles flowing up the inlet tube, circulating in the "tank" for a moment, and dividing beetween the two different outlets. The particles stayed towards the bottom of the tank and acutally appared to resemble flowing over the weir, which was what i was looking for. an actual particle study or flow trajectories? I did both a particle study and flow trajectories, but the particle study was the closest to resembling what i was looking for actually.